Norman Alfred Waldo How was the eldest son of Alfred and Edith How (née Jones), born in London at mid-Summer 1911. The couple were to have five children in all. When he joined the RAFVR in early 1939, How was 28 years old: of quite senior years for aircrew. He trained as an Observer through No 1 Air Observers Navigation School (November 1939 to February 1940) and No 7 Bombing and Gunnery School (February to April 1940). Having qualified for the Observer’s winged O badge, Norman How was commissioned as Pilot Officer in April 1940. Posted to the Middle East in May, after all-but a year on Blenheim operations with 55 Squadron in Egypt and the Western Desert, he had completed 78 raids in a touch over 500hrs. His last sortie on 26 May 1941 was incomplete: a veteran of desert ops, in his Log Book he recorded the Flying time as 1 min along with a terse Remarks entry: “aircraft crashed”. Tour expired, How was now due a period of rest on training or like duty. In June 1941 he was posted to 211 Squadron at Wadi Gazouza in The Sudan, where they were operating as a reserve training Squadron. Promoted to Flying Officer (wef April 1941) he was awarded a Mention in Dispatches in September, presumably for his work with 55 Squadron. The pace of flying duties with 211 Squadron was much easier from June to the end of September, with just 16 hours added to the Log. In November, the Squadron was absorbed briefly into 72 OTU as it “stood up”. Then the 7 December 1941 disaster in the Pacific saw the Squadron quickly re-formed, by whipping large parties of experienced ground and aircrew out of the OTU, to re-establish 211 Squadron at Helwan for the urgent move to the Far East. How was one of a number of the 211s who remained with 72 OTU in the Sudan from December 1942. The scale of the Squadron’s re-postings had made flying training activity at Wadi Gazouza rather difficult, although classroom instruction may have taken up some of the slack. In any event, How recorded no further flying duty until March 1942. By then, 72 OTU was preparing to move and take on a much larger training task. In preparation, there were aircraft to test and to ferry to the new station, at Nanyuki in Kenya. By the beginning of April, 72 OTU was setting up there and How had nearly 440hrs in the Log. Later that month he was promoted Flight Lieutenant. Nanyuki lies almost exactly on the Equator, on gently sloping temperate woodland country near Mount Kenya—a convenient landmark. The location implies even hours of daylight, while the climate is warm temperate with little variation in daily temperatures and moderate rainfall peaking in April. 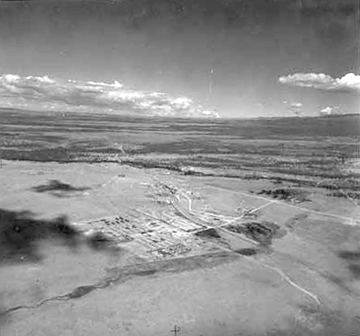 At an altitude of 6,000ft and thus high but by no means hot, all in all, Nanyuki was a fair site for an airfield and an OTU with perhaps weary aircraft. Some 70 miles away, 70 OTU at Nakuru lay at a similar altitude. Utterly different to the hot and sandy flats of Wadi Gazouza set at about 3000ft inland of the Red Sea Hills. A nice large-format aerial camera shot of the RAF encampment from the air, from Alan Conrad’s collection of photographs. 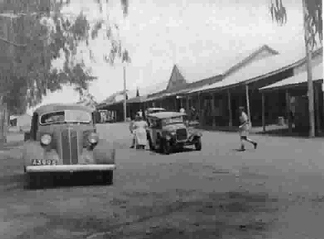 Established as a European settlement in 1907, by 1930 the branch railway from Nairobi had reached the township. Aircraft under repair at Nanyuki in 1942, photographed by Cpl Alan Conrad of the Orderly Room. The aircraft roster for 72 OTU at this time included Bristol Blenheim Is, IVs and Vs, Douglas Boston IIIs, and Martin Baltimore IIIs and IVs. Here there’s plainly a Boston on the left and a Blenheim IV middle and nearest camera. 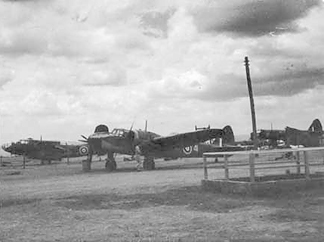 The third aircraft on the far right, rear, appears to be a Martin Baltimore, perhaps partly dismantled. Flying continued at a relaxed level for How until September 1942. From then until June 1943 there was rather more time in the air, most of it for How in the sedate Ansons: ever reliable, never fast, but with a cabin large enough to be a useful small aerial classroom. Towards the end of May, as the need for aircrew changed, 72 OTU was to disband. In June, How left Nanyuki for a period of leave before posting onwards to an operational Squadron. From late July 1943, he was navigating on operations with 148 Squadron from Egypt, Libya and later Italy, mainly special duty night ops in Liberators to drop agents and supplies to Balkan partisan forces. In six months, his overall tally had reached 100 sorties. Total flying time now stood at 830hrs, 282:45 of that at night. His proficiency as Navigator on ops with the Squadron attracted that rarest of all RAF accolades: Exceptional. Repatriated to the United Kingdom in June 1944, after instructing at 30 OTU How served briefly with 232 and 242 Squadrons. Accorded an impressive assessment at the Empire Air Navigation School in May 1945, he chose to return to civilian life soon after the war ended. Norman How died in August 2003, aged 92 years. His younger brother Douglas James How DFC had been killed in action while serving with 61 Squadron in September 1940. To compile this brief account of his war service I have drawn mostly on his RAF Flying Log Book, for a copy of which I am grateful to the helpful staff of the RAF Museum. An indication of the regard held for Norman How by his family can be readily seen from their Family Genealogy pages.